That's right! 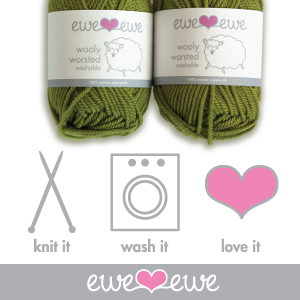 Wooly Worsted Washable by Ewe Ewe Yarns is superwash goodness. Our yarns are soft and fluffy and easy to care for. Our 100% merino superwash wool holds its color and feels great wash after wash. Knit your favorite patterns with Wooly Worsted and knit it, wash it, love it!